Micropiles are small diameter, bored cast-in-place piles, with most of the applied load being resisted by steel reinforcement. They are constructed by drilling a borehole, often using casing, then placing steel reinforcement and grouting the hole. 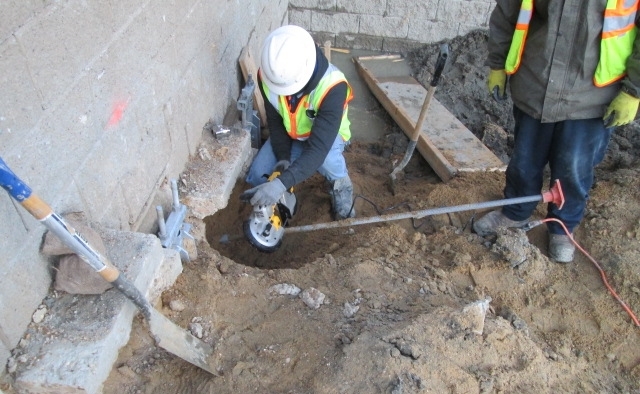 Micropiles have a wide range of uses and are becoming a more mainstream method of supporting and resupporting foundations, seismic retrofits, stabilization of slopes and even earth retention. Micropiles are usually designed in small clusters or groups with each typically carrying an equal amount of load. These piles may also be designed with a batter to improve the lateral rigidity of the group. They can be designed to resist a combination of compression, tension and lateral forces. Micropiles are an ideal pile for complex sites where low vibration or low noise levels are required, or where limited access such as low headroom and drilling is difficult. Other site conditions that make micropiles attractive are: obstructions, large cobbles or boulders, nearby sensitive structures, karst topography or high groundwater conditions. The unique characteristics of micropiles make them a perfect solution when other deep foundation methods are not suitable. The Pinnacle Pier™ is a ground improvement method using aggregate piers to improve soil for support of shallow foundations. The Pinnacle Pier™ improves soft soil and fill by vibration, compaction, and forcibly driven lifts of crushed rock into a drilled hole. Soft soil is removed from the ground and then very dense, high quality crushed rock is compacted into the drilled hole which expands the hole into the adjacent soil. The compaction and driving of thin lifts of crushed rock increases strength and stiffness, increases soil bearing capacity, and reduces soil compressibility. Pinnacle Pier™ improved soil can support heavier loads on conventional shallow spread and strip footings with reduced settlement. The Pinnacle Pier™ system works best to support shallow spread footings, tank foundations, retaining wall foundations, and embankments. A helical pile can be a solid square steel shaft, a round shaft open steel pipe pile or a combination of both square and round with one or more helical plates welded to the pipe near the tip. The pile is installed by rotating the shaft. As the shaft rotates, the helical plate advances into the ground “pulling” the shaft with it. This action is much like a wood screw. A Helical Pile is generally used to resist compression and lateral loading. Segments or sections are joined with bolted couplings. Installation depth is limited only by soil density and practicality based on economics. A helical bearing plate or helix is one pitch of a screw thread. All helices, regardless of their diameter, have a standard 3” pitch. Being a true helical shape, the helices do not auger into the soil but rather screw into it with minimal soil disturbance. Helical plates are spaced at distances far enough apart that they function independently of each other as individual bearing elements; consequently, the capacity of a particular helix on a helical pile shaft is not influenced by the helix above or below it. A Load Transfer Platform is a composite structure that distributes loads over a wider area to create a stable embankment. 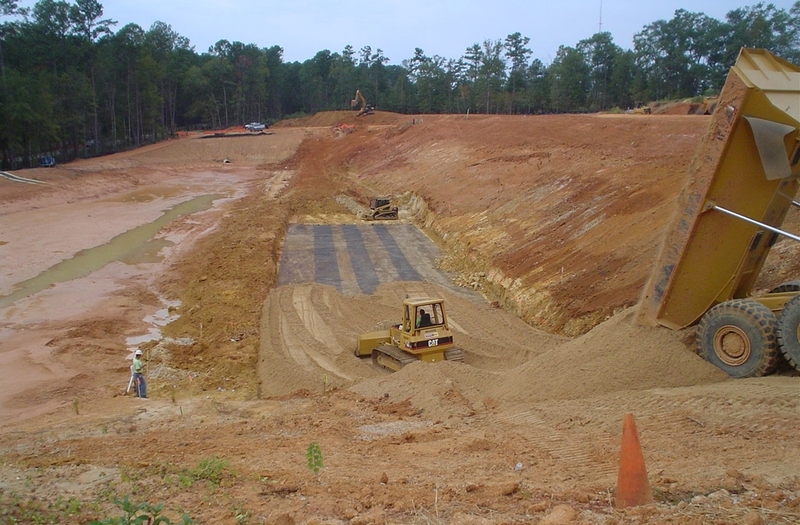 It provides a structurally sound, cost-effective alternative to over excavation and replacement, extensive surcharging, chemical stabilization and other conventional approaches. Pinnacle Design/Build engineers have designed this “snow shoe” support beneath retaining walls that were to be originally founded on low blow count weak soils. Copyright @ 2018 Pinnacle Design/Build Group, Inc.